Small metallic objects are often stronger than their bulk counterparts. This is not a new finding, but was realized as earlier as in the 1920s without knowing the precise origin of the strengthening mechanism. Today’s state of the art nanotechnology tools allow for precise sample preparation and testing of micron- and nano-sized metallic samples that exhibit intriguingly different behavior than at the macroscopic scale. Some prominent examples are the size-dependent strengthening of single crystals upon reduction of their extrinsic scale, or the emergence of a size dependence of dislocation free crystals. Mechanical testing at the small scale also allows unprecedented insights into the intermittent nature of dislocation plasticity – we can directly trace the dynamics of a few dislocations. 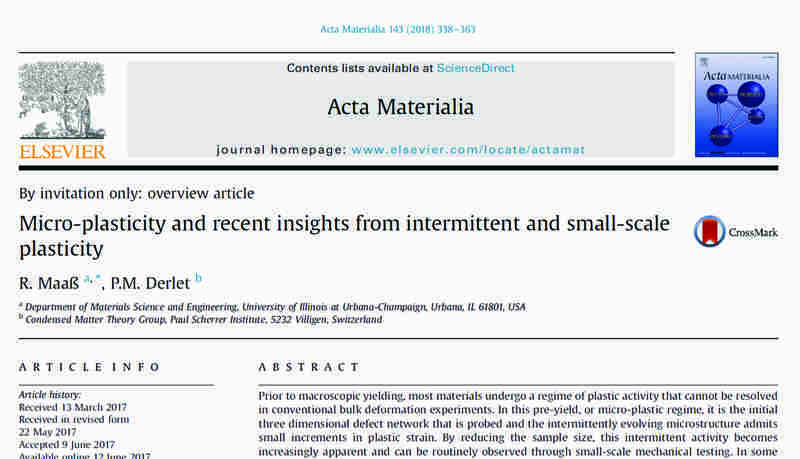 If you are interested in how we place some of the above topics in the broader context of crystal plasticity, we encourage you to read the following invited overview article recently published in Acta Materialia.